According to well understood physical parameters, the effectiveness of CO2 as a greenhouse gas diminishes logarithmically with increasing concentration and from the current level of ~390 ppmv, (parts per million by volume). Accordingly only ~5% of the effectiveness of CO2 as a greenhouse gas remains beyond the current level. This inconvenient fact is well understood in the climate science community. It can be accurately modeled using the Modtran program maintained and supported at the University of Chicago. The logarithmic diminution of the effect of CO2 is probably the reason why there was no runaway greenhouse warming from CO2 in earlier eons when CO2 levels were known to be at levels of several thousands ppmv. Remarkably, IPCC Published reports , (TAR3), do actually acknowledge that the effective temperature increase caused by growing concentrations of CO2 in the atmosphere radically diminishes with increasing concentrations. This information is in their report. It is well disguised for any lay reader, (Chapter 6. Radiative Forcing of Climate Change: section 6.3.4 Total Well-Mixed Greenhouse Gas Forcing Estimate). Accounting for the diminution effect the actual temperature reductions achievable, the calculated achievable values are in the range of few hundredths to a few thousandths of a degree Centigrade. 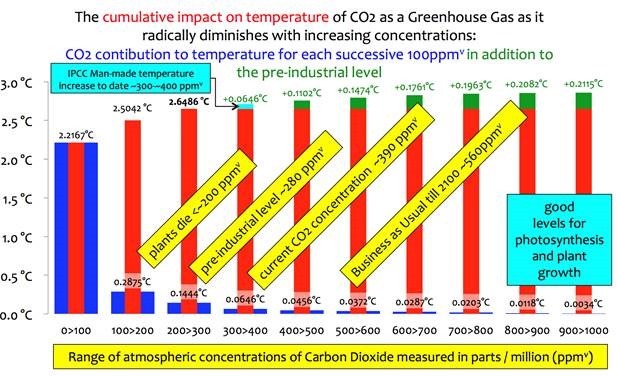 As the margin of error for temperature measurements is about 1.0°C, these miniscule levels the temperature effects for all the efforts of those nations attempting to control their CO2 emissions, (only about 12% of world CO2 emissions), are marginal, immeasurable and thus irrelevant. These minute temperature changes have to be seen in the context of normal daily temperature variations at any a single location of 10⁰C to 20⁰C. It can be as much as 40⁰C to 50⁰C over the course of a whole year. Although the IPCC tacitly acknowledges that this crucial diminution effect with increasing concentrations effect exists, it certainly does not go out of its way to emphasise it. Like the Medieval Warm Period, that they attempted to eliminate with the Hockey Stick graph in 2001, the panel knows that wide public knowledge of the diminution effect with increasing CO2 concentration would be utterly detrimental to their primary message. “Man-made CO2 emissions are the cause of climate change”. The IPCC certainly does not explain these devastating consequences for the CAGW theory in their Summary for Policy Makers. This is because the IPCC is an essentially political organisation, that is solely tasked with the promotion and presentation of Man-made Climate Change from CO2 emissions, as an accepted and non-contentious fact for world’s politicians. Any unquestioning, policy making reader is lead to assume that all increasing CO2 concentrations are progressively more harmful because of their escalating Greenhouse impact. But the opposite is so. From the present concentration of atmospheric CO2 at approaching 400 ppmv, only ~5% of the effectiveness of CO2 as a Greenhouse Gas remains. This can only give rise to a maximum of a further of ~+0.21°C. 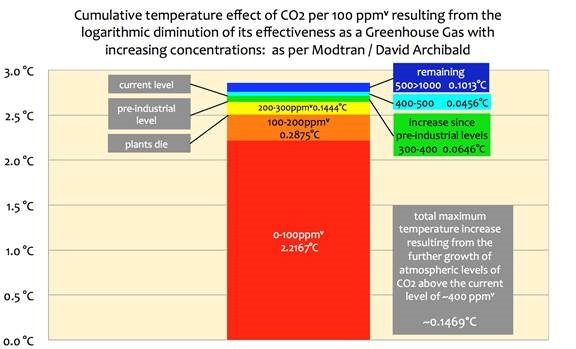 Thereafter beyond 1000+ ppmv the effect of increasing levels of CO2 can only ever be absolutely minimal even if CO2 concentrations were to increase indefinitely. could in fact never be reached, however much more Man-made CO2 was emitted. It is impossible to ever reach the much vaunted policy upper limit of +2.0 °C that has been promoted by politicians as a target upper limit of temperature effect caused by man-made CO2 emissions.